The 1969 New York City mayoral election occurred on Tuesday, November 4, 1969, with incumbent Liberal Party Mayor John Lindsay elected to a second term. Lindsay defeated the Democratic candidate, New York City Comptroller Mario Procaccino, and the Republican candidate, state senator John Marchi. Lindsay received 42.36% of the vote to Procaccino's 34.79%, a Liberal victory margin of 7.57%. Marchi finished a distant third with 22.69%. Linsday, a liberal originally elected in 1965 as a Republican with Liberal Party support, had lost the Republican primary to Marchi, but still managed to be re-elected as a Liberal. Lindsay also received the Independent ballot line. Procaccino also received the Civil Service ballot line, while Marchi received the Conservative Party ballot line. 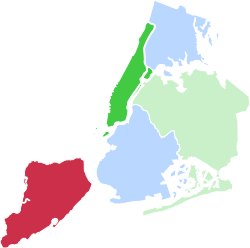 Reflecting the 3-way split in the race, with each candidate garnering double-digit support citywide, the five boroughs split between all 3 candidates. Lindsay scored a big victory in Manhattan with 67.1% of the vote, while also winning a narrow plurality in Queens with 36.3% of the vote. Procaccino won pluralities by small margins in Brooklyn and the Bronx. Marchi, a state senator from Staten Island, won that borough with 62.0% of the vote. Linsday would be sworn into his second and final term in January 1970. ^ "New York City Mayoral Election 1969". Our Campaigns. Retrieved 18 April 2014. Klebanoff, Arthur M. "Is There a Jewish Vote." Commentary 49.1 (1970): 43-47.